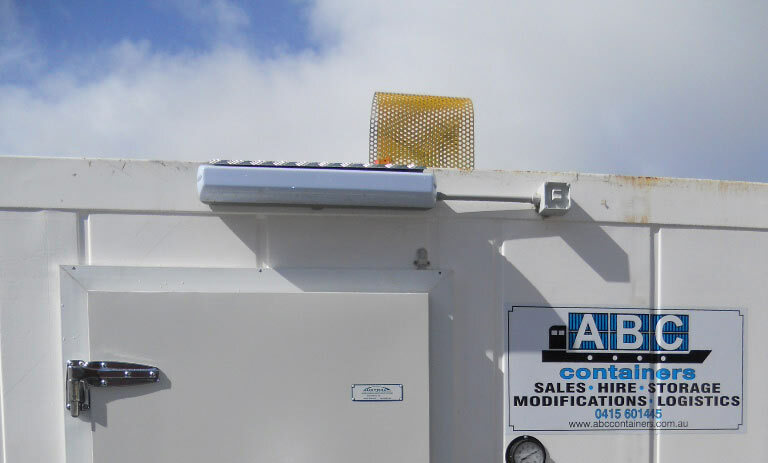 We can equip shipping containers with a standard electrical fit out that includes lights and power outlets but if you require more control over the project, consider some of the following points. When designing the electrical specs for a container, keep in mind that the internal space is typically more compact than a conventional house. It pays to think ahead and visualise yourself walking through the planned space, considering the furniture and room purpose and placing power outlets, lights, switches and phone/data points accordingly. Power outlets are standard 240V A/C, available as single or double power socket wall mounts. Fluorescent lights are also available as double or single globe units and weather proof external lights can be mounted on the roof or above doors with switch or sensor activation. Standard phone and data outlets can also be wall mounted where required. Fuse boxes are usually mounted on the internal walls and in case of failure, emergency exit lights can be fitted to the interior above exit doors. All of these electrical options are optional and can be customised to suit your modified container project.